​Should Your Next Move Be A RENT A MOVINGBOX Move? RENT A MOVINGBOX wants to make an impact. Reuse is the new Recycle! The average cardboard moving box is only used for one move and after that it's sent to the dump, landfill, or recycling plant. Yes, it's great to recycle, but, in reality it takes quite a bit of energy and water to complete the recycle process. The Greener way is to reuse! 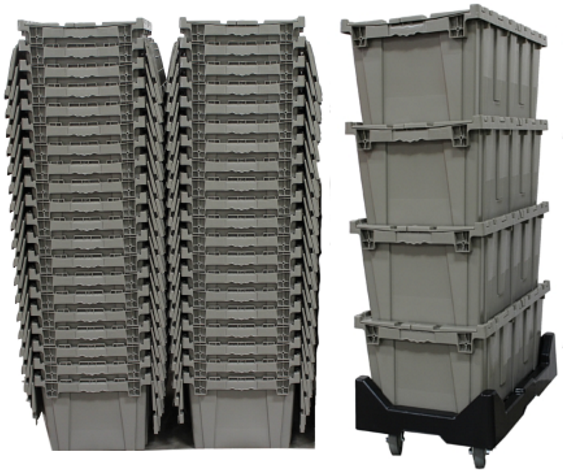 RENT A MOVINGBOX containers are made of industrial strength plastic, guaranteeing they will last for hundreds of moves. Who says you cannot make an impact, as well? 1. Do you plan to buy corrugated boxes at Lowes or Home Depot for an upcoming move? 2. Will you be spending an inordinate amount of time/energy assembling & taping boxes? 3. Do you occasionally experience "flimsy-box breakthrough" when lifting your boxes? 4. Don't want to use old, dirty, spider-infested boxes that have been sitting for awhile? 5. Gone dumpster diving to find boxes (i.e., any kind of boxes), for an upcoming move? 6. Would a green-based service be of interest if it saves you time, money, & is easy to use? 7. Are you aware of the environmental impact of buying and, inevitably, destroying boxes? Visit the RENT A MOVINGBOX website. ​Crates and dollies are ordered as preconfigured bundles. Bundle designations are defined by the number of bedrooms in a domicile and rented for a 7-14 day term. An order is "verbally" accepted by BPM after the customer agrees to terms, as detailed in our quote and, then, books a "move date", onto BPM's calendar. At completion of this step, BPM issues an order into RENT A MOVINGBOX's reservation system. A local RENT A MOVINGBOX employee, immediately, follows-up by scheduling delivery and pick-up dates, directly with the customer, based on the agreed move date. Having BPM manage and, thus, control the move date timeline is the best way to proactively avoid potential miscues. It's important to note that as an authorized RENT A MOVINGBOX dealer, your costs per bundle, as procured from us, is the same as if you bought, directly from RENT A MOVINGBOX. Green works! ​Professional movers, as a whole, love working jobs where the customer has facilitated the moving process by carefully packing smaller-sized items, and thus, making it easier to stack, carry, and organize boxes, as they're loaded onto the truck. Unfortunately, this isn't always the case, a circumstance that in no way speaks to a customer's intent to extend the process, but rather, the likelihood that a poorer quality box type was used (i.e. not all boxes are designed to move household goods). Misjudging corrugated box tolerances is probably the number one culprit when it comes to the issue of damaged goods. Despite this, many people remain reluctant to invest in higher quality boxes and, instead, opt to buy them on the cheap at a local Lowes or Home Depot outlet. At the end of the day, using such boxes could turn out to be, appreciably, more costly on a number of levels. Thanks to our partnership with RENT A MOVINGBOX, customers can now opt to use a state-of-the-art alternative, guaranteed to save, both, time and money (a dynamic that's clearly measurable). Since the service is also an "eco-friendly" one, by design, it means you'll be making a major contribution to our planet's well-being each time you use it (i.e., saves two trees for every 2-BR move, including landfill processing for 150 corrugated boxes). RENT A MOVINGBOX crates make the packing process very efficient; each is ready to, immediately, pack, stack and roll to the truck (i.e., no more boxes to assemble and tape). Constructed from recycled plastic, they are extra sturdy, stackable with interlocking covers, and reusable, unlike, corrugated boxes. Additionally, prior to each use, crates are thoroughly washed, sanitized and when delivered to your home, arrive in immaculate condition. The RENT A MOVINGBOX alternative couldn't be simpler or more user-friendly to implement. Although, we at BPM understand many customers continue to have valid reasons to use corrugated boxes, we're proud to be part of a growing body of merchants who see the RENT A MOVINGBOX alternative as one that is not only economically viable, but, environmentally appealing, as well. We believe this particular service needs to be actively promoted, especially, within the moving industry. We're all potential winners in this admirable endeavor and hope you find it a worthy cause to pursue, as well.